Hi. I am Freedom For Marine Mammals. This blog is from the unique vantage point of a young person (13 years) trying to raise awareness of the desperate plight for freedom of captive marine mammals and the welfare of marine mammals. This blog will be updated frequently. in Taiji, Japan inside the infamous 'Cove'. These dolphins, found by Japan going through migration routes, are corralled by fisherman then sold to aquariums around the world, and then slaughtered inside a secret cove. This must be stopped. 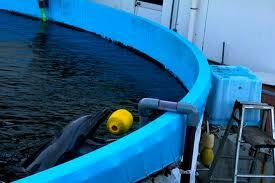 For more info, go to SaveJapanDolphins.org! The beginning of the hunting season started slow for the horrible killermen of the cove, with several days of no dolphin captures. This period of time shown as a beacon of hope that these innocent creatures might be spared their lives. The hope, love, and rejoice that no lives were taken were instantly stopped on September 5, 2011 when the killermen came back to the cove with 14 Risso dolphins, and then slaughtered them. Sadness took over all those who were watching over the Cove and the dolphins, almost as a protector. This day was a day lost. After the events of September 5th, there was another short period of five days in which the dolphins escaped the wrath of the killermen. Many were shaken as they had to watch 20-25 Bottlenose dolphins be corralled into the cove, anticipating death for all of them, on September 10, 2011. The assumptions proved wrong as surprising, though joyously, the men took but 1 adult from the entire pod, then released the others. We rejoice at this, but still mourn for that 1 soul who was taken from the sea, and pushed into captivity. For a few days short of an entire month, the dolphins were victorious. The dolphins were free in the water, avoiding capture of the cold hearted men we call humans. On October 2, 2011 although there were no dolphins captured, it was reported that dolphins are still in captivity, and being trained against their will. With the exception of one who is depressed, not eating, and floats listlessly. Many pray for these beings. Shortly after this update, it was reported on October 4,2011 that 28 Striped dolphins were corralled, and then slaughtered shamefully. It was also said that this tragedy took place directly after the killermen finished eating lunch. This tells you a lot about the men we are dealing with, and how they set their priorities. On October 7, 2011 the boats went out and chased a pod. Half got away, half didn't and are waiting to be mercilessly murdered. Two of the innocently accused are taken to sea pens and will be starved until trained to eat dead fish. There is also a pod of suspected false killer whales near the cove, and it is predicted the killermen will go after them. Its prayed they won't. Sadly, 17 of these false killer whales were captured and put into captivity. October 9, 2011 and 3 of the whales were moved into separate sea pens while 14 others await their final fate. Today is the Shinto Festival and no dolphins will be slaughtered. Today is October 10, 2011 and it looks as if the only false killer whales that are getting fed are the ones that buyers are interested in. The rest seem to be going hungry. Another sign of just how sick and disrespectful these men are. Later in the day these 16 starving whales were then slaughtered by the killermen. On the 12th October a reported 15 Risso dolphins were corralled, and slaughtered with no mercy. my attempt to help & your choice to read about it. Hi. I am Freedom For Marine Mammals. This blog is from the unique vantage point of a young person (13 years) trying to raise awareness of the desperate plight for freedom of captive marine mammals and the welfare of marine mammals.